Here in the United States, we are coming to a point where it is crucial that we find ways to offer better public transportation that lets people reduce their dependence on cars. This is evident in many parts of the US, but perhaps nowhere is it more evident than in San Francisco, where traffic jams and scarcity of parking are at unprecedented highs. However, there might also be no better place than San Francisco to implement some of the techniques that can be a model for other cities in the US to follow. In this three-part series from our corporate commuter shuttle company, we’d like to take a look at how we got here, some of the obstacles we face, and a few ideas that we can implement to alleviate some of the crowding on the roads. Public transportation in the US used to be a thriving and robust thing. Read accounts from the late 1800s or early 1900s, and you’ll realize how interconnected the transportation infrastructure was. While the best public transportation was in the cities, there was a strong availability of public transportation for people in even the most rural areas to get where they needed to go. From railway to steamboat to carriages to bicycles, transportation options touched communities from coast to coast. With the advent of the automobile, American interest in public transportation waned, leading to the demise of many types of transportation by train, bus, and subway. Who would want to subject themselves to scheduled trips on a train or bus when you could simply leave when you wanted to, stop when you wanted to, and arrive on your own time frame? Bit by bit, public transportation companies fell out of favor, went out of business, and got replaced. Car ownership was ubiquitous and few mourned the loss of the rail, bus, and trolley lines they used to have. We still have a token system that nods to the past (Amtrack, Greyhound, etc. ), but overall, these options are limited, inconvenient, or only available to people in the major cities. This has been the case for at least 50 years, and it is becoming unsustainable. Every time a person chooses to drive alone, they are making one of the costliest choices available for how to get from point A to point B. It’s costly in money when you count up the cost of fuel plus car ownership, insurance, and wear and tear. It’s costly in space when you add up the space that car takes up on the roads plus the space it takes up to park. It’s costly on the environment when you consider all the accumulated carbon footprints of all these vehicles being driven. America used to be spacious and clean enough, and Americans used to be affluent enough, that these costs were easily affordable. Now, it’s becoming less logical to continue to do what worked in the past. Our corporate commuter shuttle company wants to take our part in pioneering the type of transportation services that open the way for sustainable, convenient transportation for everyone. Reducing our dependence on cars will require us to be creative, but it will also result in a more affordable, more sustainable future for all of us. 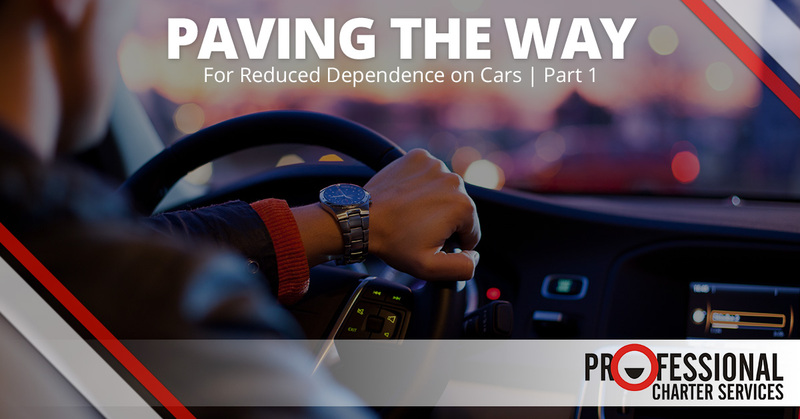 Stay tuned for our next blog, when we will cover some of the barriers in the way of reducing our dependence on cars, as well as some ideas of how we can overcome those barriers. In the meantime, please contact our shuttle service for a quote. We serve all of San Francisco with corporate commuter shuttles, intercampus shuttles, last-mile shuttle services, and more. Find out how our corporate commuter shuttle service can benefit you, save you money, and help you to play a part in reducing our city’s dependence on cars.